← How can I print a PNG image to PDF file? PDF to PowerPoint Converter can help you finish convrting from the pdf file to your PowerPoint. PDF to PowerPoint Converter is an software which was developed by VeryPDF who also has many other kinds of software products, such as VeryPDF PDF Editor, PDF To Word, VeryPDF HTML Converter and so on so forth. If you are interested in them, this is the link of its homepage. http://www.verypdf.com/index.html. 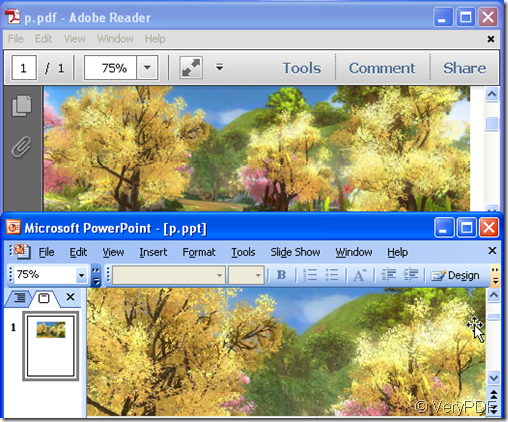 VeryPDF PDF to PowerPoint Converter can be used to batched convert Acrobat PDF files to PowerPoint (PPT) presentations . PDF to PowerPoint Converter is a professional PDF solution to convert PDF to PowerPoint 2010, 2007, 2003, 2000, etc. formats. It can retain all the original layouts, text content, images, and hyperlinks in the generated PPT presentations. VeryPDF PDF to PowerPoint Converter not only can convert pdf file to PowerPoint but also you can choose the accurate converted page. Such as you have a pdf file which has hundreds of pages but you only need one picture in it, do you need convert them all and then spend a long time to find where it is? VeryPDF takes this problem into consideration when they developed it. They made a special function menu which you can choose the exact page you want to be converted. For example, if you need Page 87, only need to input 87 in the page range menu list, then it will convert it automatically. Maybe a few seconds later, it will be shown in the PowerPoint. Let’s have a look about the special function menu in figure 1. I will show you the converted effect by figure 2. You can compare it yourself. Kindly reminder: all the pictures which have been converted by the VeryPDF PDF to PowerPoint Converter only can be used as background. You can not edit them in the PowerPoint. Maybe for someone who want to reedit them is a defect but this for others who want to use them as a part of PowerPoint or use them the background is a advantage. You can add the picture in any part of the PowerPoint as a whole. With the help of PDF to PowerPoint Converter, you can add the accurate picture in your PowerPoint. Who can help me translate the Russian in pdf file? If I want to translate this pdf file to many languages then it could be shown for many countries' students who can help?